For so many aquarists, the green mandarin fish (Synchiropus splendidus) is a must-have species. Its endearing personality, exquisite finnage and intense coloration rarely fail to impress. Given these highly desirable traits, it has for long been among the most popular marine aquarium fishes. Thus, many thousands of specimens of this species are sold in the ornamental fish trade each year. Most of these are wild caught. This is unfortunate, as wild caught individuals have a rather poor record of survivability compared to captive-raised individuals. This for a number of reasons. For one, the mini-spears that are used to harpoon wild individuals during capture frequently cause serious internal injuries or infections. Moreover, this species often suffers from malnourishment after being subjected to the typical fast during transport. By the time a mandarin arrives at the retailer, it may be (even with the most devoted, professional care) beyond the point of no return. For these reasons and more, it is always a good idea to opt for an aquacultured mandarin fish. One could argue that it is always better to go with cultured livestock; but in the case of mandarins, the difference between captive-raised and wild are enormous. The biggest, and most notable, difference here is in their feeding habits. Wild caught specimens might eventually begin to feed, but never accept anything other than live foods. Some wild individuals might not ever resume feeding in the aquarium at all, perishing in very short time. Individuals that have been raised in captivity, on the other hand, are far less finicky. They are comparatively voracious eaters, even greedily accepting frozen (that is, dead) items such as cyclops, small mysis or baby brine shrimp. Being completely reared in an aquarium environment, they even might arrive already trained to feed on prepared items such as fish pellets. Opportunistically nabbing these extra food items when available will afford the animal a few extra, precious calories; it will not, however, provide a substitute for the continuous availability of live items such as copepods. From the shape of their mouths to the function of their digestive tracts, mandarins are specially adapted to feed on microcrustaceans such as copepods and amphipods. While studies have revealed that mandarins prey on a fairly wide variety of critters (even baby snails), pods always form the bulk of their diet. Because their prey is so tiny, they must eat a very large number of them to fulfill their dietary intake requirements. Indeed, in the wild as in the aquarium, mandarins begin hunting as soon as the sun comes up and do not stop until sunset. They will—and must—feed constantly. In captivity, heavy predation by even a single mandarin can significantly reduce pod populations. Even if the keeper periodically adds new pods to the system (as they should do), the population might not remain at a density capable of supporting the mandarin over the long term. As numbers of pods in the tank decrease, the fish must expend more time and more energy to locate its next bite. If pod numbers get critically low, the mandarin will struggle to meet its metabolic needs and begin to starve. Aside from general lethargy, a telltale sign of starvation in a mandarinfish is a noticeable loss of body mass; this will show as a sunken belly as well as long indentations on each side of its back. This is where the supplementary offering of frozen/prepared foods can make all the difference. A few additional bites of frozen brine shrimp might help to give a newly arrived (i.e. recently shipped and very hungry) mandarin a much-needed boost. If used regularly, foods such as this can also help to keep it healthy and plump over the long run. Varying a mandarin’s diet in this manner might additionally serve to ensure that it is getting all of the vitamins and minerals it needs. What is most important is that the item does not exceed the animal’s miniscule bite size. Due to the animal’s small stomach (i.e. inability to gorge) as well as its need to eat nonstop, frozen/prepared foods should be considered to be snacks only. Though these items can be of huge benefit, they only comprise a fraction of the animal’s diet; even in captivity, pods will always be their bread and butter. Therefore, the keeper should ensure maximal feeding opportunities for their mandarin by regularly adding a diversity of live microcrustaceans to the system. For this, a mixed-species, live harpacticoid (i.e. bottom-dwelling) copepod product such as Poseidon’s Feast is ideal. Remember: if you cannot easily and quickly find pods crawling on the glass of the tank, then your mandarin probably won’t, either. It could also do considerable good to occasionally offer live “treat” items. Quality live baby brine shrimp such a Nano Brine can not only add to their diet, but provide valuable behavioral enrichment (particularly for the chase they give!). For sure, the greatest challenge of keeping a mandarinfish is feeding it properly. The easiest way to accomplish this is to provide both a continuous supply of live pods and frequent feedings of a frozen or prepared fish food. Of course, to be sure that the fish will accept the latter fare, one should acquire a captive-raised specimen such as a Biota Captive-Bred Green Mandarin. When purchased at AlgaeBarn, these mandarins not only come with a 100% Alive-On-Arrival Guarantee and a 7-Day Health Guarantee, but have also underwent a one week observation period to ensure that they are healthy and eating before they are offered for sale. Starting with a sturdy, tank-conditioned, disease-free individual that is eating well will give you the very best odds of enjoying your mandarinfish for many years! For more information about Biota Palau and their captive breeding efforts, please visit their site at http://www.biotapalau.com. 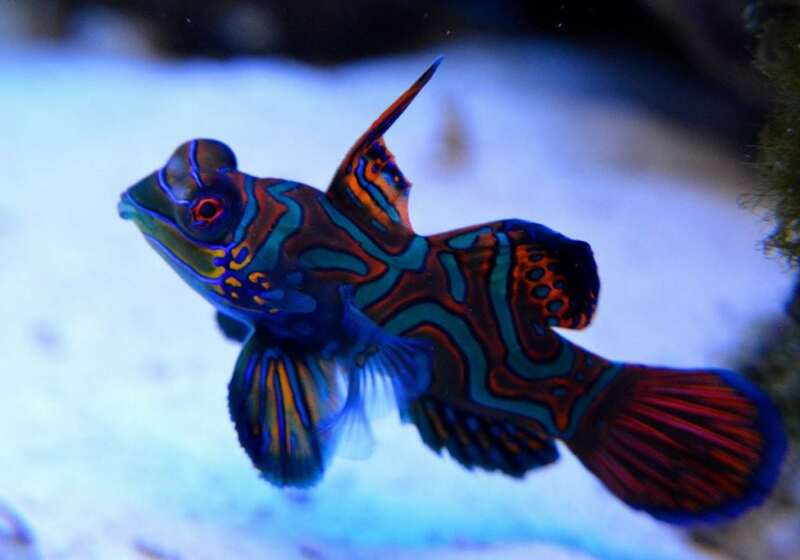 For more information about the captive diet of the mandarinfish, please read our articles Mandarin Goby Fish Care: Using Copepods to keep a Mandarin Dragonet and Keeping and Feeding the Mandarin Fishes. This is great it allows more people to keep this beautiful fish! My Mandarins all have an ample supply of pods but they also love baby brine shrimp, frozen mysis, frozen bloodworms & salmon eggs. I’ve also recently even gotten one of them to start eating frozen Ocean Nutrition cubes…both the carnivore & omnivore ones which is great! I’d love to own a captive bred mandarin! This one of the fishes that captivate my attention ones I begin in the hobby but it keep me a side for the demanding requirement on their diet. But with this captive breed and with a reliable source of pods available at a click of a key. Its the best time to own, keep and enjoy this beautiful Goby’s. I really hope to win this little couple for my granny! Mandarin aren’t available too often in our area and they would bring her hours of enjoyment!